Yams are similar in flavour and appearance to the sweet potato but they are not actually related to them in any way. 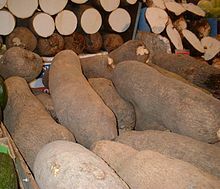 A true yam is the tuber of a tropical vine Dioscorea batatas. Yams are sweeter and moister than sweet potatoes, and can grow to up to seven feet in length, weighing anywhere up to 150 pounds. In the US, a variety of sweet potato is sold under the name "yam", but true yams are very rare and generally only sold in ethnic shops. They are common in the Caribbean, Latin America and Africa. True yams are toxic in their raw state, but cooking of any form removes the toxins and makes them harmless. They're generally sold in chunks sealed in plastic, and have a light-coloured interior and dark skin. They can be used in any sweet potato recipe.